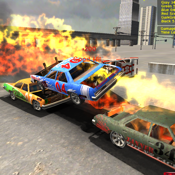 Take part in a demolition battle on city streets between old worn out cars using the latest in high tech 3D rendering, physics, collisions and interaction. You must last the longest, take the least damage, and score the most points within the time limit. Attack with your rear bumper and avoid chasers coming in with trying to T-Bone you from the side. This game features detailed urban environments, city roads, buildings, and many different types of cars.